It is well-known that cadets at both RMC and CMR St Jean have more demanded of them than students at other universities. 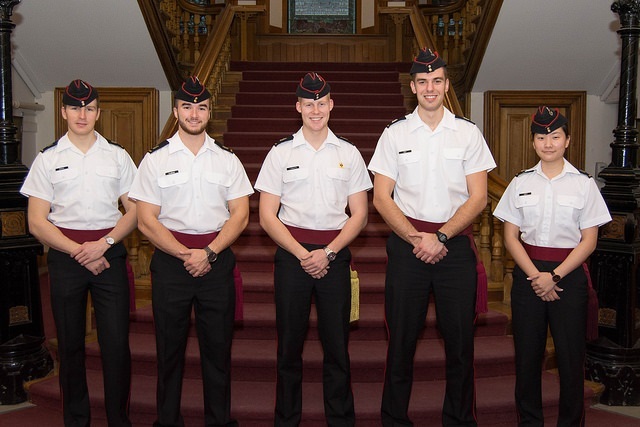 One of the unique challenges at military college is that senior cadets have the added responsibility of maintaining the discipline and deportment of their more junior peers. 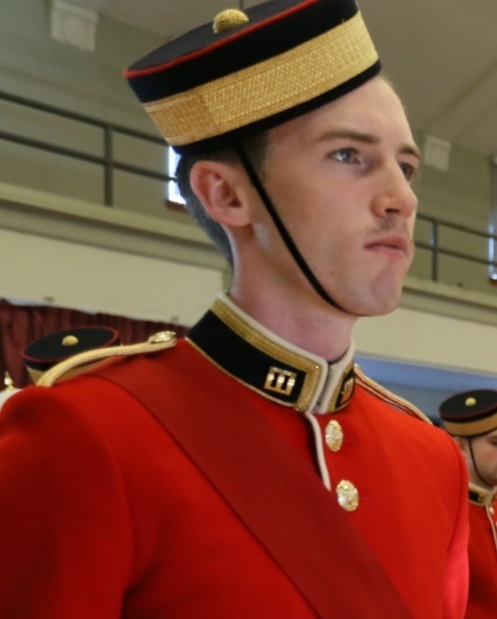 While everyone at RMC holds the same military rank (that being OCdt), some cadets are given bar positions, which represent their leadership positions in the Cadet Chain of Authority. A cadet can earn a two, three, four and five bar position during their time at the College. Two bar positions, which are considered the most junior, usually represent Cadet Section Commanders (CSCs) or other junior leadership roles (i.e. Squadron Ops Officer, Sports Officer). Three positions, which are more senior, represent Cadet Flight Leaders (CFLs) and other senior positions Administration and Training officers at the Squadron and Division levels. Four bar positions are reserved for Cadet Squadron Leaders (CSLs) and Division Leaders (CDLs), as well as most members of the Top 5. The Cadet Wing Commander (CWC) holds the Cadet Wings sole five bar position. Aside from the gold bars on their shoulders (collar for 4s and scarlets) three bar men and up also wear distinct red sashes. Three ‘barmen’ wear their sashes across their shoulder while four and five barmen wear them around the waist. The CWC also has a unique gold tassle on his/her sash. Usually, third and fourth years are chosen to hold bar positions. However, on rare occasion, second years may be chosen to fulfill the duty of a junior barmen. Last semester, when I was in second year, I was fortunate enough to chosen to hold a two bar position, as a CSC for Montreal Flight, 12 Squadron’s second year flight. The duties of a CSC are pretty straightforward. They are essentially the first link in the chain between the Cadets and their Chain of Authority. As such, they are responsible for the administration, discipline and well-being of the 6-8 people in their section. Although I was only a CSC for about half the semester, I found the experience to be rewarding and a good starting point for future leadership appointments. It helped that my section was comprised of Cadets in my year who consistently strived for excellence. Upon beginning FYOP, the wide-eyed first years are immediately instructed to memorize the names of CFLs, CSLs, CDLs and the Top 5. Of course, this inevitably leads to ambitious Cadets who hope to one become the CWC. My advice to these first years is that while it’s admirable to have lofty goals, they must enjoy the journey towards achieving them. Instead of viewing a two bar position as a chore or a “check in the box” to climb the ladder of success, they should make the most of it and learn as much as they can before moving forward. 1. Communicate! Pass on information quickly, concisely and clearly. 2. Be available and willing to help. 3. Be lenient and patient but never afraid to correct a shortcoming. 4. Trust your section, most cadets are responsible and will exceed your expectations. When I return to RMC for the fall semester, I will be moving onto a three bar position, as 12 Squadron’s Administration Officer (CSAdO). I’m sure that my previous experience as a CSC will serve me well as I undertake this challenge. The Cadet Chain of Authority is one of the staples of the OCdt experience. Although it does not transform cadets into exceptional CAF leaders overnight, it does grant cadets some practical leadership training.